As Apple CEO Tim Cook continues to make his rounds in Europe, Good Morning Britain managed to catch him for a quick interview while he was visiting Woodberry Down Primary School yesterday. Regarding fake news, which has been an increasingly hot topic since the U.S. Presidential election got into full swing last year, Cook said that "this is one of today's chief problems." In the wake of growing fake news, companies like Facebook have taken action to bring the quality of an article to their users' attention before they share it with their friends. For Apple, Cook said that the solution to the problem is not a simple one. "We have to give the consumer tools to help with this. And we've got filter out part of it before it ever gets there without losing the great openness of the internet. And so this is one of today's chief problems, it is not something that has a simple solution." Cook covered another topic during his stay in London this week, discussing Brexit with United Kingdom Prime Minister Theresa May. According to The Independent, in the talk Cook said that he is "very optimistic" about the UK's future outside of the European Union, and that it will be "just fine," although there will undoubtedly be some "bumps in the road along the way." In a statement released after the meeting, Apple said: "We are proud that Apple's innovation and growth now supports nearly 300,000 jobs across the UK." Apple will continue to back the UK in the future, as it currently plans on building a new headquarters at London's Battersea Power Station, expected to be complete by 2021. After its completion, 1,400 employees will be moved from eight locations around London to occupy the company's new UK offices. Early this morning, Cook also continued documenting his European adventures on Twitter, congratulating the Tate Britain art gallery after he visited its digital artwork exhibit. Yesterday, he stopped in the offices of ustwo games in London to get a sneak peak at the latest mobile game from the company behind Monument Valley. The chief problem is that people aren't educated enough in critical thinking to be able to discern which news is fake. Ok I get that fake news is basically an evolution of political propaganda, but is it "one of today's chief problems"? Seriously? What about global conflict, population growth, food security, pollution, habitat destruction and species loss, disease, global warming, inequality between and within nations, the plight of Africa...? And just what does Apple expect to do? I don't use Apple's News app (deleted it) because I disdain anything that tries to track my activity and preferences. I'm smart enough to get my news from quality sources when I feel so inclined and to read critically even from those. The onus is predominantly on the individual here. Fake news has developed because of a tendency for certain people to believe what they want to believe regardless of truth, which has always existed (case in point: religion!) and the chief combat for this is education. Seriously, this is just another fluff piece and useless musing from Tim Cook to try and make him sound socially progressive when really he's just the head of a major global corporation. I feel like he's more politician than anything else these days. As Apple CEO Tim Cook continues to make his rounds in Europe, Good Morning Britain ('https://twitter.com/GMB/status/829992194366902272') managed to catch him for a quick interview while he was visiting ('https://twitter.com/tim_cook/status/829748543103627264') Woodberry Down Primary School yesterday. Regarding fake news, which has been an increasingly hot topic since the U.S. Presidential election got into full swing last year, Cook said that "this is one of today's chief problems." In the wake of growing fake news, companies like Facebook have taken action ('https://www.nytimes.com/2016/12/15/technology/facebook-fake-news.html?_r=0') to bring the quality of an article to their users' attention before they share it with their friends. For Apple, Cook said that the solution to the problem is not a simple one. Cook covered another topic during his stay in London this week, discussing Brexit ('https://www.macrumors.com/2017/02/09/tim-cook-theresa-may-brexit/') with United Kingdom Prime Minister Theresa May. 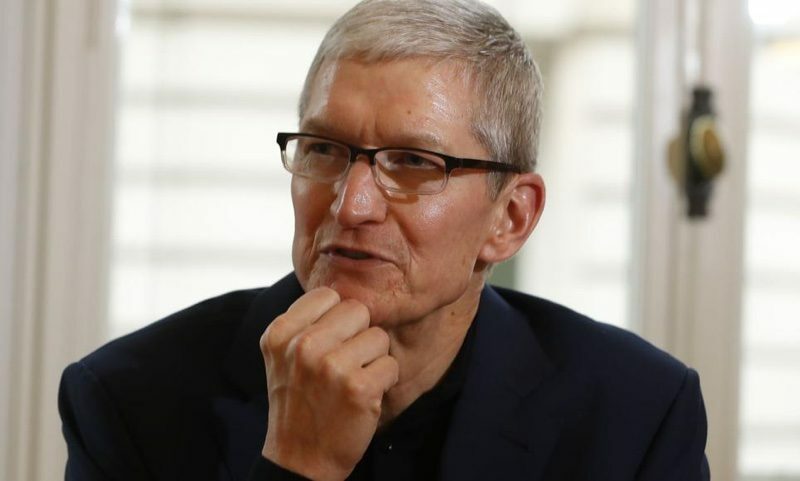 According to The Independent ('http://www.independent.co.uk/news/business/news/apple-tim-cook-brexit-theresa-maty-very-optimistic-uk-future-tech-downing-street-meeting-a7572721.html'), in the talk Cook said that he is "very optimistic" about the UK's future outside of the European Union, and that it will be "just fine," although there will undoubtedly be some "bumps in the road along the way." Apple will continue to back the UK in the future, as it currently plans on building a new headquarters at London's Battersea Power Station ('https://www.macrumors.com/2016/09/28/apple-plans-offices-battersea/'), expected to be complete by 2021. After its completion, 1,400 employees will be moved from eight locations around London to occupy the company's new UK offices. Early this morning, Cook also continued documenting his European adventures on Twitter, congratulating ('https://twitter.com/tim_cook/status/829996681550667776') the Tate Britain art gallery after he visited its digital artwork exhibit. Yesterday, he stopped in the offices of ustwo games ('https://twitter.com/tim_cook/status/829747892982263810') in London to get a sneak peak at the latest mobile game from the company behind Monument Valley. Please focus on running your company to the best of your ability and spend less time on politics and being a social justice warrior. P.S., if you can find the time could you please update your desktop computers sometime this decade? It's like News Papers these days are no longer that, they have become "Opinion Papers". It's heartening to see a leader who (unlike Zuckerberg) realizes that news media is now permanently linked with the way technology companies create their systems and build their interfaces, and that these companies bear a civic responsibility to make sure that unscrupulous actors and propagandists are not taking advantage of them. This is especially important when our president can't grasp the difference between "fake news" and "news that reports something negative about him." This is all only going to get worst in our post-fact age, unfortunately. From a company that spins as much as they do? Can't have been said with a straight face. News programs have become the typical TV series, entertainment at best. Agreed! I would counter that The Chief Problem at Apple is that its CEO is paying way too much attention to political and social issues and not on the actual company.